Thanks to @NomTheBurritos for this art piece! At the end of episode 25, we witnessed Jester, Fjord, and Yasha get taken by Lorenzo and his group of traffickers. We don’t know what direction they were taken in, and while it’s certainly a dire situation, the three of them, and the remaining members of The Mighty Nein, are certainly not without options at their disposal. Fjord has a couple of things in his favor right now. First, he has the ability to change his appearance whenever he wants with Mask of Many Faces. With as high of charisma as he has, the combination of the two could afford him the opportunity to get him, Jester, and Yasha out of the situation they’re in with some deception. Second, he can summon his falchion and put it into its pocket plane at will. That’s a huge advantage for dealing some surprise damage to their captors, should they manage to get out of their manacles. Where Fjord is going to need assistance is getting his manacles off- he’s likely not strong enough to break the chains with brute strength. He also needs to get the gag out of his mouth; all of his currently-known spells require a verbal component. If he can get ungagged, Hunger of Hadar would help the three of them get anything that was taken from them (like Yasha’s sword) and get away without being seen. Jester is strong enough to stand a chance at breaking her manacles, and having free hands and feet would be a huge step in getting them free. Jester, like Fjord, requires a verbal component for her spells, so getting the gag out of her mouth is key to their escape. If they can manage that, she has the entire range of trickster cleric spells at her disposal, including Disguise Self, Spiritual Guardians, Silence, Pass Without a Trace, Blindness/Deafness, Locate Object (for their taken weapons/goods) and Spiritual Weapon. She can also Invoke Duplicity, which could distract the smugglers for just long enough as they chase one of their acquisitions for the three to get away. Sending would be amazing to let the rest of The Mighty Nein know what’s going on, or potentially any crownsguard that could send a force after smugglers. Yasha has the best chance at getting the three of them free of their manacles and cage by sheer force. She is potentially without her weapon, which was wrested from her when they were kidnapped. 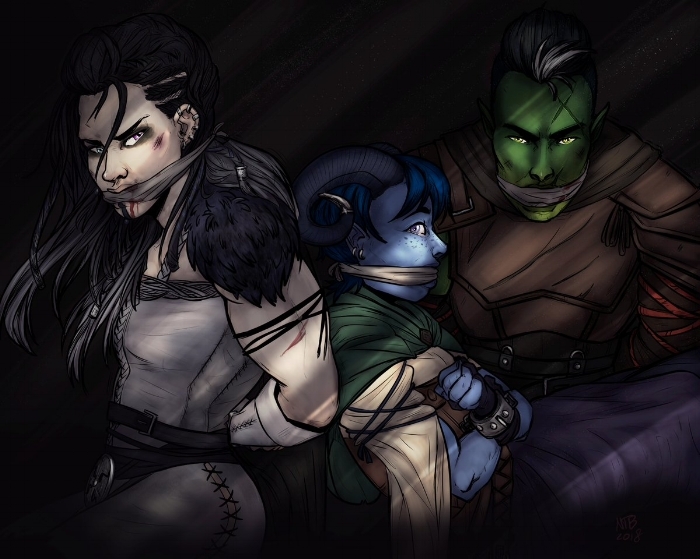 If they can escape their cage, Jester and Fjord can cast a variety of spells to help her get her sword back and get them out of reach of the smugglers. And if they don’t get out without being noticed, she’ll have a much better chance of fighting them off with her sword in hand and rages ready. It should be noted that their captors have displayed significantly more competence than any of the other assailants the Nein have come across on the road up to this point. A combination of potent spells, strategic isolation, and sheer manpower speaks to a well-organized trafficking operation that has thrived under the nose of the empire even before the threat of war distracted it. Assuming the three can act before the traffickers unite with more reinforcements, it’s surely possible to escape, but strong illusions, disabling magic, and iron bars are not so easily overcome. Thanks to @TheBirdFox for this art piece! Assuming the remaining Vier of the Nein decide to go after their missing colleagues, they’ll have to make up several hours of head start the kidnappers have on them, since the Drei were taken around 1:00 or 2:00AM. None of them are proficient in perception, though Beau, Molly, and Caleb all have +3 bonuses. More importantly, Caleb is proficient in Investigation (+8), as is Nott (+6), and Beau (+5). That will help them to find clues around that will enable them to track the carts. In terms of Survival checks, Beau, Molly, and Caleb all have +3 bonuses. If they discover that the carts went back towards Hupperdook down the Crispvale Road, Caleb’s Keen Mind feat will aid them greatly in navigating their way back towards their friends. If they discover that one of the members of the trafficking party was a fey, fiend, or undead, Molly would then have advantage on any survival checks to track them and intelligence checks to recall any information about them. Unfortunately, none of the spells that Caleb, Nott, and Molly know are very helpful in this situation. It’s always possible that Caleb knows more spells than he’s mentioned yet, but even so, short of knowing Fly or Sending, there aren’t a lot of spells on the wizard spell list that would help in this circumstance. To add pressure, there is still the looming deadline the Gentleman has set for them. Without Jester in tow to send a message that they’re on their way back, the party has 15 days remaining to get to Shadycreek Run, deal with Ophelia’s situation, and return her safely with them to Zadash to complete the contract. Certainly doable, but difficult with half the party gone, and equally difficult to allot time for a chase against a large professional trafficking syndicate.